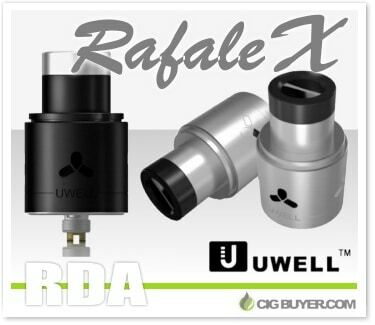 From the makers of the Crown and Rafale tanks comes an interesting new rebuildable dripper – the Uwell Rafale X RDA. At first glance it looks like your typical four post design, with a two-hole positive post in the center and negative posts on the sides, but the center post is actually neutral – and removable. This allows for a huge range of building possibilities: vertical, horizontal, parallel, quad, micro or nano coils. The Rafale RDA has adjustable airflow (flavor and cloud modes), wide surface build deck, deep juice well and a 14mm ABS drip tip system with removable anti-spitback.